I went back and forth on whether I should post about this or not. I also asked Voss if he was okay with it (Voss being my spectacular husband, fellow officer and all around great guy, if you’re new here). He said it was okay, so I am going to write about it very briefly. Mostly Manalicious doesn’t have very much that’s personal, but this is going to be personal. 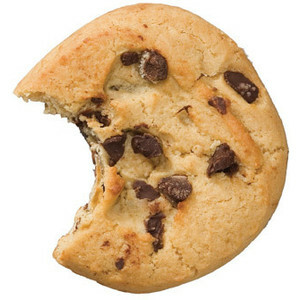 I am still playing, and raiding. I still feel like I have a lot to say about many things and Manalicious isn’t going anywhere. That said, it’s been hard for me to focus as my family has been going through some troubles requiring my attention, and this week we got some terrible news. Back in 2008, Voss’ dad had chemotherapy for ganglionic cancer, I’m not sure if that’s the correct terminology in English as I get most of these descriptions in French. Anyway, his chemo then was pretty successful and he’s been well since – his hair grew back in, and he is one of the most ridiculously healthy people I know. He runs and goes to the gym and eats well. Thursday he called to tell Voss that his cancer has come back and it’s pretty bad. It is being biopsied but he may need to have surgery to diagnose it correctly and then after that he’s going to be starting rounds of intensive chemotherapy – requiring that he be in hospital for a week at a time, in complete isolation. His chances of survival are about 50/50. Needless to say, the two of us were devastated by this news and feeling stuck because we want to help but his dad lives in Montreal and we are pretty far from Montreal. So over the next several months we don’t know what’s going to happen – we’re definitely going to be taking an unplanned trip to Montreal, possibly several. Right now it’s the uncertainty and the fear that makes everything hard, as I’m sure anyone who’s gone through this with a family member or themselves can understand. We will have to be unavailable to raid and won’t be able to play at all, but we’re not sure when. It depends on the outcome of this initial diagnosis. What does that mean for Manalicious? I’m a bit distracted, is mostly what it means. I could post this and then be hit by a fit of productivity and write three posts, or I could not post for a little while, and I apologize for that. I’ve always tried to maintain a fairly regular update schedule of two-three posts per week but I can’t promise that for the next while. I hope everyone understands and will let my name in your respective blog feed remain unbolded for a time, with the understanding that I fully intend to return when I can. If you’ve ever wanted to write a post you think would fit with my topics here (raiding, guild leading, guilds, mages, classes with mana bars, pugs), please feel free to talk about it with me. I welcome any quality guest posts at this time and thank you for your patience while we figure out our travel plans and hope that Voss’ dad is going to be okay. Sadly, it isn’t the same as mine. But it could be if you were ready to put on business socks and apply to mine. Where are you? You’re in a raid instance with the guild your guild could be. What’s in your hand? Back at me. I have it! It’s a calendar with an invite to the raid you love. Look again, the invite is now spellpower plate we’ve been disenchanting. Anything is possible when your guild wears business socks. (I’m on a pally horse). More plainly, you’ve all heard about my guild. We’re a guild that’s been strict ten since ages ago (April 2009). We’re almost two years old now! 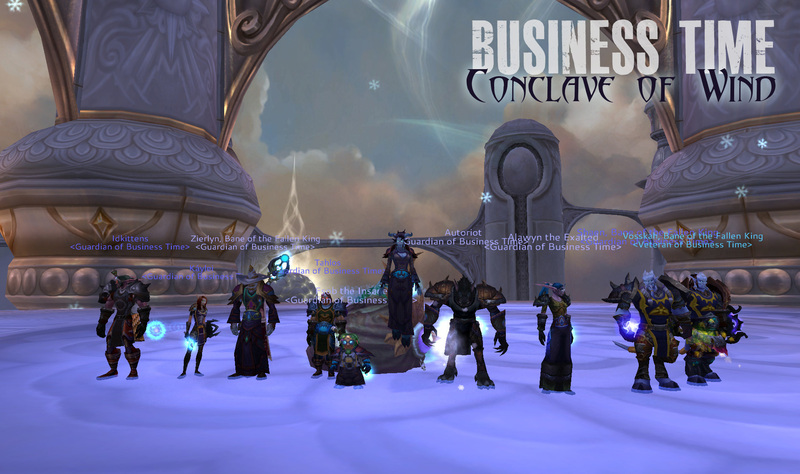 We finished out Wrath by achieving Bane of the Fallen King after getting our Frostbrood drakes back on June 1st. We’re currently 10/12 with available content (Al’akir, Nefarian remaining) and will be heading into heroic modes over the coming weeks. We are based on Moonrunner US (PvE, PST) and we raid Mondays, Wednesdays and Thursdays from 6-9 PM PST. In a nutshell, we are a tight-knit, small group of adults dedicated to progression raiding on a schedule that actually works with people’s lives. Our members have jobs and other things they are doing, so we pull at start time and not a moment later (or else Voss’ head explodes). When we raid we’re serious about it (I’m really trying hard to avoid making another Flight of the Conchords joke here, so just bear with me). Thanks to incredible stability and very low member turnover, our roster is almost the same now as it was a year ago – no mean feat, I think! The commitment of our members is itself a testamony – BT folks tend to stick around, and we like it that way. We don’t have roster openings very often. Unfortunately, real life stuff (happy real life stuff such as getting engaged and moving!) is going to be claiming our holy priest in the next while and we’re going to need another dedicated healer (a solid off-spec wouldn’t hurt, either, but we’re primarily looking for a holy paladin.) I’m hoping that since my original blog seemed to attract many awesome holy paladins interested in watching the noob flounder cheering me on, that perhaps some of you still read and might be looking for a great guild. Our current healing roster has two restoration druids, a restoration shaman and a holy priest – so we’ve got no paladin in this role at all. We think a paladin would be just perfect (although if we don’t have luck finding one we might consider a different healing class). If you have any questions feel free to ask them here, on our website, or you could drop me a line via Twitter or my e-mail (puggingpally AT gmail DOT com). And if you aren’t looking for a guild but you have a friend who might be, please consider spreading the word! I appreciate any mentions or links immensely. 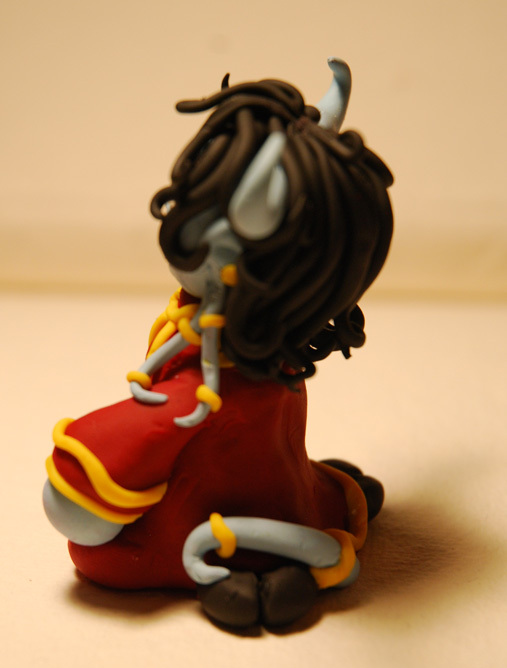 I have a bit of a twist for art day this week with some Sculpey I was playing around with months and months ago. I took the photos and just never posted it! "What about THE FANGS?" That's from an Ellen stand-up routine. +10 geek points if you have any idea what I'm talking about! This is a small Millya, she sits on my desk and keeps me company during raids. I may sculpt these things just as an excuse to make little hooves. 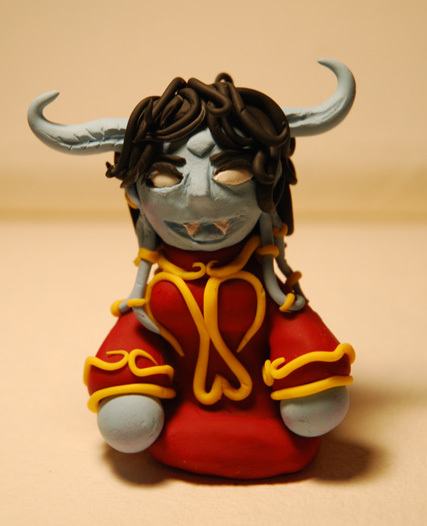 She is right next to mini-Vidyala, once posted on Pugging Pally but I don’t think I’ve used it here. I wanted to try using coloured Sculpey instead of the all-one-colour kind because my results with painting that stuff before hadn’t worked out very well. Painting three-dimensional things is not my strong suit. 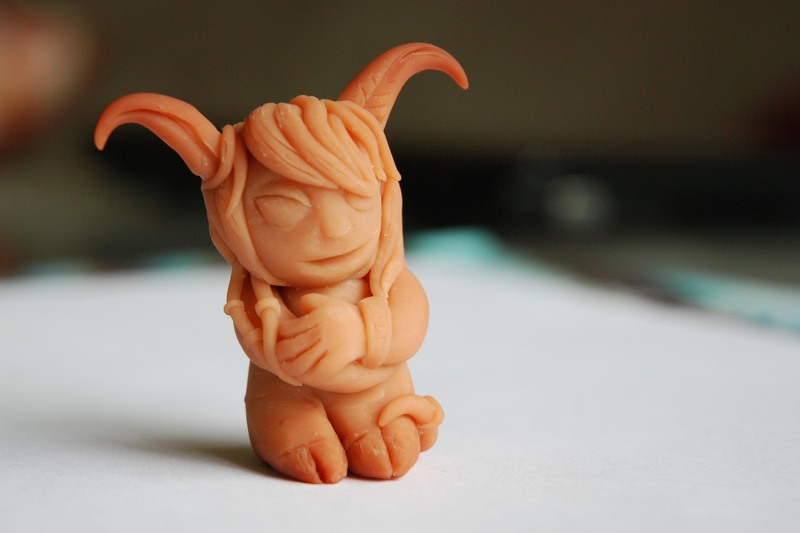 I also burnt mini-Vid’s horns, something I managed to avoid with the coloured Sculpey. And neck tentacles, those are fun to make too. Finally, I used to get really fun and weird search terms, but almost all of my search terms now tend to be practical ones (looking for a mage gear guide, heroic guides, etc.) Here are three I feel I can actually answer from the last week or so. What spec should a mage be when running heroics in cataclysm? There’s no specific spec you should be, really. Play a spec that you enjoy. I haven’t played Arcane at all in Cata but it is a very strong, single target burst spec that will serve you well for single-targeting down anything in packs. I personally run as fire in heroics (as I do in raids) because extreme familiarity with a spec is generally beneficial when you move from five to ten or twenty-five or whatever. If you have muscle memory for what to do on a boss in a five man, you probably will also know what to do when the boss is bigger (and has more loot). Fire carries some inherent risks because Living Bomb can potentially explode and break CC, so watch what you’re doing there. 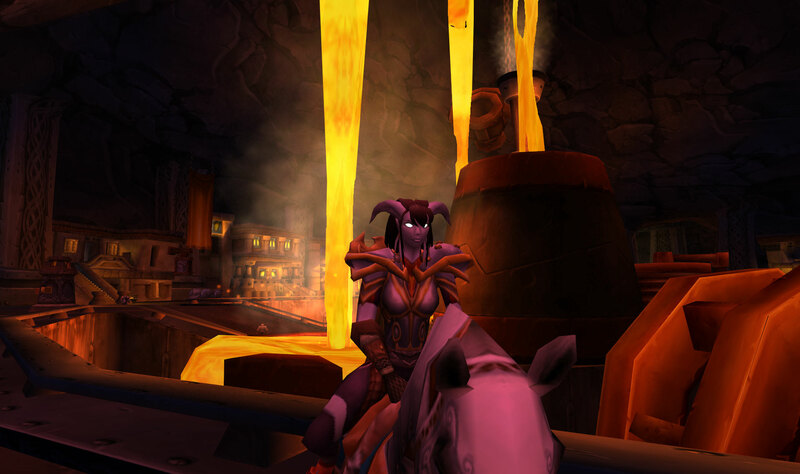 Truthfully, in all the guild heroics we do we’re doing a lot of AoE now and so Fire is awesome for that. I wouldn’t assume that is the case with any pugs, though. Flame Orb has also been changed to not break Polymorph any more (but it will still break other CC effects). Frost is a solid choice for heroics as well, you get quite a bit of passive damage mitigation and it also has incredible burst. On any given boss fight if I’m running with my fellow mage (he plays Frost) he starts out ridiculously ahead of me (damn you, Deep Freeze!) but it usually evens out after my ramp-up time. Actually, he still beats me – he’s very good. It was very necessary at lower gear levels, and is starting to be less necessary (especially with additional upcoming changes in 4.0.6). You can see this section about mana management at EJ for more details. Ideally you are managing your top DPS rotation to coincide with Molten Fury at a minimum, or any other burn phases (Magmaw’s exposed pincers, etc.) I have found that since my gear has improved – and taking into account necessary movement components of a fight where I will be scorching in any case – I don’t run OOM anymore and can maintain a straight-up Fireball rotation for most of the time. How much scorch weaving you are obliged to do is going to depend on your gear level, your mana, and how long the fight is going on (average DPS of your raid). I’m sorry, it’s not us – it’s you. We are awesome, as usual.